Security, Convenience and Safety are all perfect reasons to have an automatic gate and TOPS Security Solutions are just the team to help you from design and installation to servicing. Our friendly team will help discuss your needs and put together a package just for you. 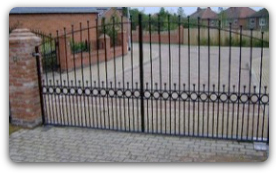 TOPS Security Solutions Ltd has vast experience in automating both domestic and commercial gates. Since the late 90’s we have been installing and maintaining electric gate systems for a variety of customers. Not only has this given us valuable knowledge when it comes to designing, installing and maintaining systems but also of which equipment will give reliable trouble free operation – as this is our aim for each and every installation we complete. We can automate anything from a domestic 5-bar gate to large commercial sliding gates using a variety of operators including surface mounted rams, underground operators or sliding gate motors. The equipment we use from manufacturers like BFT, CAME and FAAC are all chosen for their reliable, trouble free operation. We offer a free, no obligation site survey which will be carried out by one of our experienced surveyors. During the survey we establish the best options for automation and go through all of the varying options such as Entry Phone Systems, Keypads, Remote Keyfobs, Exit Buttons, Exit Loops, Safety Photocells and a whole array of other accessories and considerations that you will need to think about when you are looking to automate your gate. We are not tied to any one manufacturer meaning that we can specify the equipment that meets your needs exactly.